Emcee Electronics, Model 1140 Micro-Separometer Mark X - Welcome to Oilybits U.K.
For quality control purposes, water separation characteristics of fuels are rated to determine the amount of surface active materials (surfactants) present. Surfactants degrade the performance of filter separators used to remove water from the fuel. The presence of water can impair engine performance and initiate microbiological growth, which can cause corrosion in tanks and filter plugging in fuel lines. Also for quality control purposes, fuels are subjected to “Clear & Bright” tests to determine the amount of free water and particulate matter in mid-distillates. The Model 1140 Micro-Separometer is a electro-mechanical instrument used to perform four discrete tests. ASTM Standard Test Methods D3948 (Jet), D7224 (Jet) and D7261 (Diesel) are used to rate water separation characteristics and D4860 (Jet or Diesel) detects and numerically rates free water and particulate contamination. 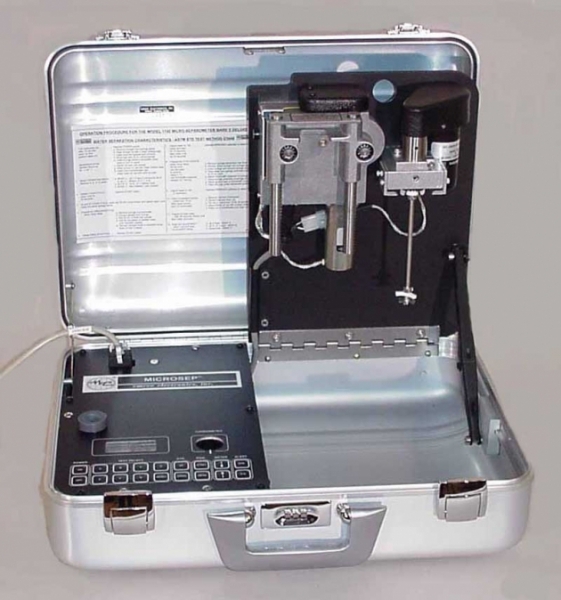 This instrument performs each of the four tests above simply by using one of the four “Six Packs” containing the proper coalescer cells. Test Method D 4860 passes a portion of the sample through a filter medium, which is collected in a clear glass, vial. The vial is placed in the turbidimeter and the meter is adjusted to 100. The processed fuel is discarded and a portion of the unprocessed fuel is placed in the vial, which is re-inserted in the turbidimeter. Higher ratings, 100 is maximum, indicate that there is less free water and particulate present. 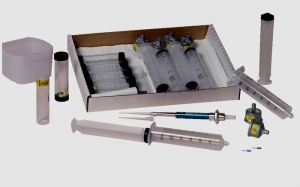 A box commonly known as a “Six Pack” that contains six test kits is shown. Each Test Kit contains vacuum packed expendables that are used to perform a single test. Each coalescer/filter is labeled to identify the type of fuel and the applicable ASTM method to be used. A container of distilled water is also included in each Six Pack to perform water separation tests.